The first word that comes to mind when I think about Mauritius is beautiful. The marine life is beautiful, the landscape is beautiful, and the people are beautiful – inside and out. From the moment I landed into Sir Seewoosagur Ramgoolam International Airport, I was made to feel welcome. At every turn, you are greeted warmly in a community of people who are always willing to help you. 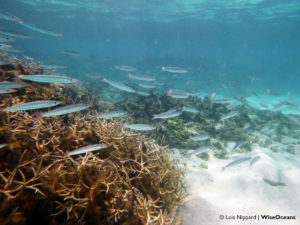 In Seychelles, I had been used to snorkelling every day in the same stunning bay that is Petite Anse. Grabbing my mask and fins and walking straight into the ocean. 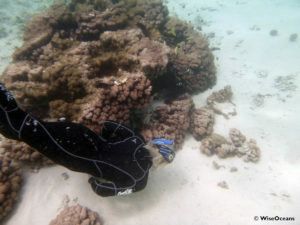 However, in Mauritius, the guided snorkels we offered were something else. From the resort, you jump on a speedboat and head south along the coast for 30 minutes to an incredible site called Eau Bleu. 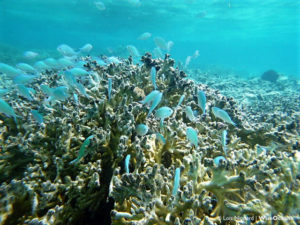 The enormous branching coral there creates a metropolis for reef life. With all the nooks and crannies providing shelter and food for a whole manner of creatures. 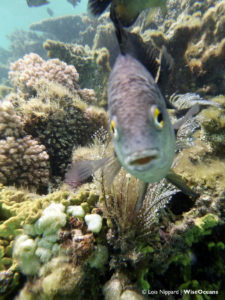 You have the territorial one spot demoiselles that get in the way of every picture you are trying to take, by duck diving you can find tiny brittle stars clinging to the underside of coral, you can see big barracuda sauntering past, and tiny blue-green chromis in schools sparkling in the sun’s rays. 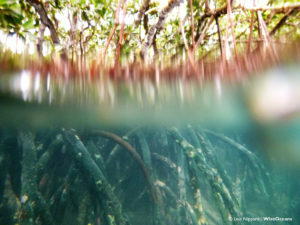 Deep in the mangroves is another story. Swimming through a forest. 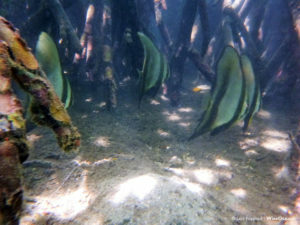 Peering at all the juvenile fish seeking shelter in amongst the propped tree roots of the mangrove and poking your head out of the water to see the terrestrial life going on above. 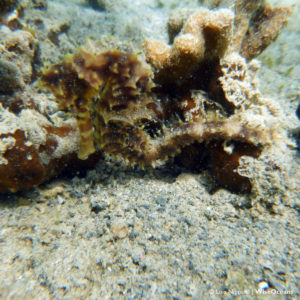 Not to mention spotting my first seahorse! Snorkelling in the mangroves truly is a very unique experience. With the new Coral Cabana on the beach at the resort, it was the perfect ‘office’. The ideal location to talk with guests and resort staff about the marine environment and what we can all do to protect it. It was so lovely to see how people were inspired to make a difference. It was wonderful to see how the resort management took value in our work and are supportive of what we are trying to do achieve. 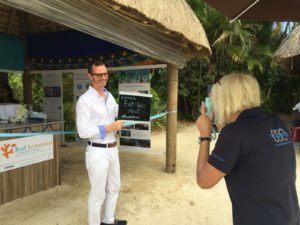 I was lucky enough to be a part of the 10th anniversary of the resort and it was heart-warming to see how they acknowledged their staff and their loyalty over the years. The past two months were simply brilliant. I made wonderful friends, had amazing experiences, and I will treasure that for a long time. Thank you, beautiful Mauritius.